The Agricultural Research Council is faced with a mammoth task to not only safeguard national food production of South Africa through research and human capacity development but also play a vital role in the transformation of the potato industry. One of the ARC’s key areas of responsibility is to safeguard the national food basket and to provide South Africa with high quality and nutritious food to combat hunger and poverty. Over the years the ARC has invested in research and technologies to improve one of the most consumed crops, potatoes, a staple in most South African homes. Since 1960 under the Department of Agriculture the ARC developed its first breeding programme which formed the cornerstone of the potato industry then and led to the mass production of potatoes and contributed significantly to the development of the more than a seven billion Rand farm gate value potato industry we know today. The ARC boasts the initiation and support of the establishment of a number of well-functioned private laboratories over the years that today provide the potato industry with clean planting material, in addition to its own laboratory and gene bank. The establishment of these laboratories is another feather in the cap of the organisation that is in the DNA of the agricultural sector for over 100 years, and its commitment to providing the potato industry with quality and heathy material that combat malnutrition and hunger. As part of its development and nurturing of the growth programme of the potato industry in South Africa the ARC has, since the 1980s to date, been providing requisite training in mass propagation. As a neutral entity and an organ of state, the organisation is the custodian of the gene bank which is a national asset that is also mandated with alleviating the risk of food insecurity for the nation and the well-being of the industry. All the successes enjoyed by the ARC and the potato industry has, at times, witnessed some setbacks which threatened their vibrancy. Despite all the challenges that the industry sometimes face the ARC steadfastly continues to be the Number One and go-to solution provider to their daily programme through its highly skilled and trained workforce and world-class technologies. The ARC consistently continues to use technology to assist both emerging and commercial farmers to mass propagate the production of planting material and grow their profits. Some 10 000 smallholder farmers are also enjoying growth under the tutelage of the ARC in various ways. Changing climatic conditions continue to plague the potato industry leading to ongoing challenges such as reduction in productivity potential and increased pests and disease occurrence. The ARC through its expertise, is best placed to provide climate-smart solutions to the industry and safeguard the national food basket and the potato industry by developing high yielding drought - and pest resistant crops. In this regard the ARC recently released two new potato cultivars into the industry with another two to be released in 2018. ARC President and CEO Dr Shadrack Moephuli is confident of the future of the potato industry and the role of the ARC. The ARC together with its clients will continue to ensure that the potato varieties maintained by the ARC remain true to type. As a result of recent potato variety mixing in the industry the ARC is currently doing an ongoing investigation to its own laboratory and gene bank. Pretoria: The Agricultural Research Council (ARC) contributes to the South African potato industry with innovative, environmental friendly research, technology development, technology transfer and scientific solutions to improve potato production in the country in support of a sustainable industry. The ARC also conducts research on a number of serious potato pests and diseases, which have significant impact on the industry. If not timeously prevented and controlled these pests and diseases could have devastating effects on the industry. 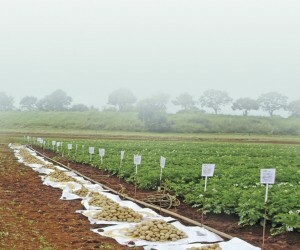 The ARC hosts the only active potato breeding programme in Africa (with the exception of a few University-based initiatives) with the focus on high yielding varieties with good skin finish and resistance to heat, drought, late blight and common scab. Late blight has been a challenge for breeders since the Irish Famine in 1845 to 1849. 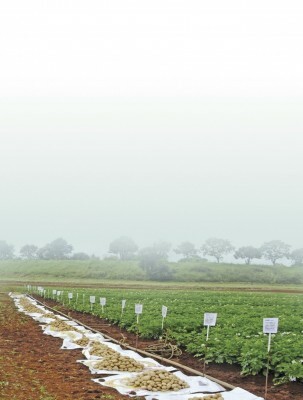 Even with all the new fungicides outbreaks often cause huge losses in the potato industry. This is also the most severe disease that restricts good yields for small scale farmers that cannot afford the modern fungicides. The ARC is at the forefront of research on late blight with international collaborations with the Swedish University of Agricultural Sciences and Rostoch University in Germany. This joint research focuses on marker-based selection breeding for drought and late blight resistance. Other aspects the ARC potato research is focused on is the use of resistance inducing chemicals or extracts to increase natural resistance of potatoes to late blight. This is intended to reduce production costs to small-scale potato producers in South Africa. What is late blight and how does it affect the potato industry? Late blight of potatoes is caused by the fungus-like oomycete pathogen Phytophthora infestans. It can infect and destroy the leaves, stems, fruits, and tubers of potato plants and has devastating effects on the yields. The ARC is key in the development of new cultivars that are adapted to the South African climate (since 1960) and the breeding material and cultivars are maintained in the National Cultivar Collection since the 1980’s. In addition to the release of varieties the ARC developed technology that will allow mass production of its new varieties into the industry and the ARC was key in the development of tissue culture procedures to assist the rapid multiplication of potato seed. For the potato industry, the ARC is rightly regarded as the only neutral body that can service the industry in the supply of mother plants for the production of clean seed. The ARC remains committed to provide excellent services to the industry and strives to improve systems through continued research in the improvement of production technologies and efficiencies. Over the years the ARC has also established itself as the benchmark with regards to common scab, several fungal and bacterial diseases of potato, potato tuber moth, potato leaf miner and Tuta absuluta and remains committed to providing excellent services to the industry and strives to improve agricultural systems through continued research in the improvement of production technologies and efficiencies.